Posted on Sat 14 Nov 2009 at 3:20 AM PST. Filed under Filmmaking. It’s been over 2.5 years since the release of the HV20. 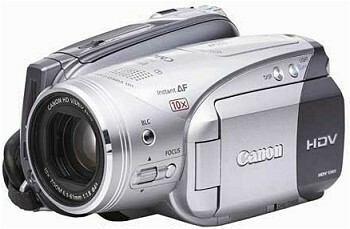 During that time it became the most game-changing camcorder to ever hit the market: it was the first consumer camera with 24p support, and with its improved lens/sensor, it inspired thousands of amateur filmmakers who were previously limited by the hardware to do what they always wanted to do. Some amazing videos were shot with the HV series, short films, and about 600 official music videos too — an amazing feat for any camera, let alone a consumer one. However, in the quickly-moving technology of today, the HV series is now fading away: it’s bowing to AVCHD cams, and to the Canon 5D and 7D dSLRs. Once upon a time there were as many as 30-40 HV videos uploaded on Vimeo daily, now we are lucky if we get 5-6. Obviously, as with everything, its time is passing. It’s fully functional of course for those who want to still use it, and it still outperforms some non-Canon AVCHD camcorders! But most artists from the “old gang” on Vimeo have moved on, and I have done so too with my recent purchase of the 5D Mark II. Special mention: The Condition:Human sci-fi web series. * The asterisk denotes the usage of a 35mm adapter. More of carefully selected best-of-the-best HV videos can be found on the HV group.